I spoke with the developer of The Airport Mall, Mr Wong Yep Meng, when he visited Brunei recently and he shared some of his misgivings, indeed his alarm, at what appears to have happened to his project since he agreed to allow TAIB to complete it. Mr Wong has, (through his lawyers), requested a copy of the floor plans for The Airport Mall from TAIB more than once, but they have still not received a copy. Mr Wong wants to know how a building that would have cost him twelve million dollars to complete has now cost more than double that amount. In addition, why a building projected to finish in six months by TAIB’s own appointed engineers has taken years to finish? “In December 2005, the banks engineer stated that it could be completed by April 2006. That is why I agreed to let TAIB finish the project,” said Mr Wong. He went on, “The idea behind The Airport Mall was to provide a shopping mall location for the same cost as a shophouse. We recognised that there was an over-supply of shophouses in Brunei and we wanted to make The Airport Mall a low cost shopping mall to compete with the shophouse. Brunei’s shopkeepers pay very high rents considering Brunei’s small population and The Airport Mall was designed to offer them an alternative to high rent shophouses. TAIB do not seem to understand this. It is matter of dispute that they had any right to spend huge amounts of extra money for no apparent benefit. In fact, I appear to have fewer units now than when we started! The number of units in The Airport Mall seems to have shrunk, and if so millions more dollars may have been lost!” Mr Wong said. There are many questions to be asked and answered about the strange case of The Airport Mall. It now seems more and more likely that the only place that they will be asked and answered is in a court of law. The long-suffering investors in The Airport Mall may at last be seeing some light at the end of a very long, dark and difficult tunnel. However, it comes at a huge cost to someone. The estimated cost of completing the original project, when it first started, was $12,000,000. However, the development stalled at birth. Morsima Sdn Bhd., the original developer and still the owner of The Airport Mall, claimed that progress payments from the bank, TAIB, were frequently delayed, and that this caused huge problems for the company and the project. Eventually, in 2005 Morsima Sdn Bhd reluctantly agreed to handover responsibility for finishing The Airport Mall project to TAIB. This was at TAIB's suggestion, and on the understanding that TAIB would complete the project without delay. The estimated cost of completion at that time was $4,000,000. But, this completion date never materialised. In fact, very little work seemed to be done at The Airport Mall, causing even more worry, frustration and anger among investors. Nearly three more years passed before TAIB appointed a contractor, and signed a widely publicised agreement in September 2008 with United Engineering. UE are a highly respected company with considerable expertise in their field. TAIB never explained why it took them nearly three years to appoint a contractor to finish The Airport Mall. Could all parties involved in The Airport Mall now heave a collective sigh of relief? Not quite. In those three years, the cost of raw materials and other services had risen and the estimated cost of completion was now nearly $9,000,000. More than double the $4,000,000 that it would have cost three years earlier! In fact, the contract awarded for completion of The Airport Mall was for the sum of $8,836,330.90. However, even though this is more than double the four million dollars that was estimated in 2005, apparently it is still not enough! The cost of finishing the project has now ballooned to a whopping $12,703,247.54. More than the cost of the whole project back in 2002 when it first began. This represents a huge increase in costs. About 50% more than the awarded contract amount and this on a building that was nearly completed anyway! The time that the project has taken to finish is another matter causing some speculation. The project should have taken ten months to complete; the planned completion date was 14th June 2009. However, it is now running five months late! For a 3 year contract to be five months late is bad enough; for a comparatively short, ten month contract, to over-run by five months indicates that there is a major problem somewhere in the system. Where could it be? I asked the two parties involved TAIB bank and United Engineering, “Why has The Airport Mall cost so much to complete and why has it taken so long to complete it”? Hjh Zazarina bte Hj Zainuddin of TAIB's Corporate Finance Division refused to comment about the reasons for the huge increases in the cost of completing The Airport Mall. When asked why the project had taken so much longer to complete than expected she again refused to comment. The CEO of United Engineering, Mr. John Lee, when asked what caused this huge budget blowout and the long delay in completing the project said he could make no comment on these matters as he was bound by terms of confidentiality to his client, but that his company, as the main contractor, was not responsible these aspects of project. The Managing Director of Morsima Sdn Bhd, Mr Wong Yep Meng, who is still the owner of The Airport Mall, was both stunned and alarmed when informed of the huge cost increase in his project. He says that TAIB never informed him of these massive cost increases. In addition, TAIB have never informed him about any other problems that they were having completing The Airport Mall on time or on budget. He cannot understand how TAIB can justify spending the nearly thirteen million dollars that they claim to have spent, on the project. He says that The Airport Mall was about 80% finished when TAIB took over responsibility for completion in 2005. He cannot understand why it was not completed for four million dollars back in 2006, as he expected it to be. So far, almost everyone seems to be a loser on this project. However, there is no bigger loser than Brunei. The Airport Mall, with over 170 shops, a supermarket, and bowling centre, will create about 700 jobs. To put this in perspective, the four hundred million dollar methanol plant in Sungai Liang will create, (according to the BEDB website), about 130 jobs. The Airport Mall represents a huge lost opportunity for Brunei. With the best will in the world, the government can no longer be expected to find jobs in the civil service for everyone. It is up to the private sector, to do all it can to create jobs for the nation’s most important resource, which is no longer oil, but all those young Bruneians who need jobs upon which to build their lives and their future. But, the private sector cannot do it without the cooperation of the banks. It is to be hoped that when The Airport Mall finally opens its doors for business that it will live up to the hopes and dreams of Mr Wong Yep Meng, the man who created it, as well as all those who have waited so long for their investment to bear fruit. What is the best investment house or land? get a return for years. house loan. A nice arrangement. generous tenant who also acts as an unpaid janitor that takes care of your house. It is a fantastic investment. WHAT IS THE BEST HOUSE FOR INVESTMENT? What type of house should I buy? repayment period. That says it all! the rental return is usually better. fall into disrepair is bad for your business. be fully modernised to make them attractive to higher paying renters. HOW DO YOU MAKE YOUR HOUSE ATTRACTIVE TO POTENTIAL TENANTS? paying tenant then you have to invest and renovate your property. tenants looking for cheap rents, around $600 to $800 per month. Renters paying more want a modern, hygienic kitchen with plenty of cupboard and workspace and a modern cooker. grimy, blackened and cracked, with new tiles. The same applies to dirty or torn curtains. will have to bear all these costs yourself, then the net rental return is lower. return that you can from your house rental business. IS IT BETTER TO OFFER A FURNISHED OR UNFURNISHED HOUSE? kitchens and bedrooms, plus a cooker and curtains. and they add value to your property. If you do not have them then get them fitted. It will make your house a much more attractive proposition to clients and it will give your business an advantage over others. Never forget that you are in a business. And a very competitive one. Part of your job as a business owner is to stay one-step ahead of the competition. The tenant should be able to move in his furniture and live in the house he is paying good money to rent. He is not the house owner and he should not have to buy fixtures and fittings! unfurnished house may be worth considering. businessperson, you will have a good chance to be successful. I do not propose to say as much about investing in land as the reasons for doing so are more varied and complex. they are still affordable and they will be busy suburbs in the future. develop in the right locations. children and their children, for generations to come. I definitely do not mind working in an office but I also take the opportunity to get out and about. It usually happens only to visit a house or survey lands for sale in the suburbs. 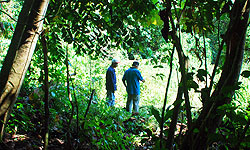 Occasionally, I do get a client who wants to sell a piece of land in the jungle which serves to be more interesting. Brunei with its abundance of oil and gas, has never had to exploit its jungle habitat which fortunately, that means there is a wealth of jungle all around us. When I first arrived in Brunei, I used to wonder how everbody coped without air conditioning. The answer is simple. They did not need it. Living in the suburbia, surrounded by baking hot concrete and tarmac constantly results in the heat radiating back at us. No wonder we can't live without air conditioning. Its totally a different scenario when you step out of the hot sun and enter into the shades of the jungle canopy. It is like stepping into a different climate zone. It is not only cooler, but it is like an envelope of peace descends around you. The stillness of the trees and the quiet of the forest contrasts with the incredible abundance of life everywhere. By comparison, in the suburbs only a few miles away, we are subjected to the constant noise of a non-stop flow of traffic. In the jungle, apart from the occasional birdcall or gentle swish of a passing troop of monkeys swinging through the trees, everything is incredibly quiet and peaceful. The idea of living close to nature obviously appeals to someone. From the little way along the track that leads into the jungle, there is an unfinished house. With a grand size of about four thousand square feet, it has not been completed and is now falling into disrepair. 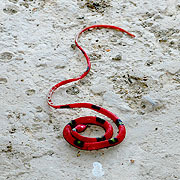 The house only had one inhabitant, a deadly looking red and black snake. However, such things do not trouble intrepid real estate agents in Borneo. We take these things in our stride. Especially when they turn out to be made of plastic! When I enter the jungle I found stands of bamboo everywhere, and judging by the signs, some had been recently harvested for their shoots. It is hard work, but you can make a couple of hundred dollars in a day or two by collecting bamboo shoots and selling them. As I sheltered in the comparatively cool air of the jungle canopy, the land owner and interested party discussed the value of the land. It occurred to me that, although we rather casually place a cash value on a place like this, in reality it is priceless. We take for granted the paradise around us, because incredibly, it is so commonplace. We casually assume that it will always be here and that it will always be like this. We now understand that our environment is much more fragile than we once believed. Just because this paradise is a commonplace to us, we must not become complacent. The earth is the only home we will ever have, and probably the only real home that humankind will ever have. We must always remember, its real value is much greater than the cash value that we place upon it. Published 21/8/09 - Borneo Bulletin. The only inhabitant in the house. This beautiful home could be transformed into a business centre or a dream house. THE word ‘ghost house’ is probably enough to send shivers down anyone’s spine. Don’t be alarmed though as the houses aren’t haunted nor do they have ghosts. Instead, these are houses, which have remained vacant for years, and it’s a shame to see the once beautiful homes and grounds in deteriorating conditions. With a little effort, they could be shaped into fine homes once again. Scores of locals in the sultanate wish to have a home of their own and the empty houses in Bandar can easily be transformed into the kind of homes so many dream of having. Postcard Views of Brunei - With Delicious Food. The Arts and Handicrafts Training Centre in Jalan Residency is probably the last place you would think of going for a good meal. The Tarindak d' Seni Restaurant may well change your mind about that. It recently opened on the first floor, specialising in Malay cuisine at an affordable price. It's an attractive restaurant with excellent food and services. But that wasn't what attracted me to it. When my wife suggested we try a new restaurant for breakfast, (they have a breakfast buffet on Fridays, Sundays and Public Holidays), I instantly reached for my Nikon. The Tarindak d' Seni has a unique feature, and it doesn't cost you a cent to enjoy it. While sitting down enjoying my meal, right in front of me were stunning views of Brunei's world-renowned water village, Kampong Ayer. With the best of local Brunei cuisine, the panoramic view of the water village, overlooked by a variety of mosques, and The Istana Darul Iman gave an overwhelming experience to it all. The non-stop to and fro of water taxis busily buzzing back and forth across the Damuan is a testimony to the energy and enterprise of the people of Kampong Ayer. If you happen to have a shutterbug in the family, show him or her a little thrill and take them for a meal to the 'Tarindak'. They will appreciate it, and may even offer to pay for the meal. Though I wouldn't bank on that. Construction works are well underway at Kampong Ayer's new Tourism Centre set to open sometime this year. 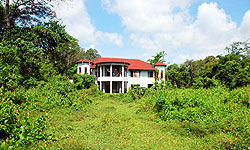 Its most prominent feature is the 'lookout' that offers amazing views of Kg Ayer and beyond. The attractive interior of the new centre, located at Kg Lorong Sikuna, has yet to be completed and once the building is ready to be launched, it will be a great asset to Brunei's historical heritage and the sultanate's tourism industry. The tourism scene in the sultanate has been an unlikely success story as it competes with neighbouring countries filled with interesting tourists attractions. Brunei's success in this field is quite astonishing. Nowadays, buses are loaded with tourists and have become a rather common sight around town and Kg Ayer, which is one of the main tourists hotspots in the sultanate. We now have larger and better tourist boats, which takes visitors on a cruise through the water village. Hats off to the Tourism Development Department of MIPR for their hard work and creating a new building destined to become a landmark in Brunei. Is Sungai Kebun Ready For This? IT’S only five minutes from Brunei’s super mall, Yayasan, and the town centre, that’s by boat of course, but Sg Kebun’s own shopping facilities are still in the dark ages. A row of what is little more than ancient wooden stalls is the entire Sg Kebun shopping experience. But all this is about to change. An enterprising developer has decided that Sg Kebun is ripe for expansion and has put his money where his mouth is and built two blocks of shophouses in what can only be described as a ‘daring’ shade of yellow. They are still empty so one can only hope that sooner or later similar enterprising retailers will take advantage of them and the residents of Sg Kebun will have their own modern shops, cafes and coffee houses. And no doubt, the very latest Hollywood films will be available at a bargain price! Vitamin D is free. You just have to take a walk in the sun and sunlight acts on your skin to produce it. In need of some exercise and probably vitamin D as well, I picked up my camera set off on a fine sunny evening to see what secrets Simpang 316 may hold. You never know what you will find along the most innocent looking simpangs in Brunei. They may look innocuous from the outside but when you go into them, you find all kinds of unexpected things. You are never far from the jungle in Brunei. 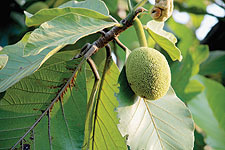 Remnants of jungle exist everywhere and native species of trees and fruit are all around us. I think if you really wanted to you could live off the land in Brunei. Bananas in particular are readily available and so it was that the first thing I came across was a few fruiting banana trees. Most of the bananas had gone, to either the landowners or the enterprising local monkeys that are also quite abundant in many parts of Bandar. The 'Banana Heart' was still intact, it is not much used today but it used to be eaten steamed or raw. A little further along I came across some Tarap. I have never tasted the stuff but if abundance is anything to go by it must be popular. Homes ancient and modern are represented in Simpang 316. Well, not ancient perhaps, but traditional. There are still a few traditional wooden houses left in Brunei. Perhaps it is sentiment but they seem to me to have a unique charm. Of course, Brunei has come a long way in the last 30 years or so and its many splendid modern homes make an interesting contrast with the traditional wooden stilt house. Simpang 316 has both. There is a myth common in government circles that Brunei Malays are not as enterprising as they should be. Perhaps ministers are judging the real world by their own departments? They have not noticed the Nasi Katok signs every 50 yards or so that adorn most main roads, nor the market stalls that do a roaring trade in Gadong and other areas. In addition, the fact that Brunei, even with its small population, has a great many more shops than say, an English town with a similar population would have. Many of them well run Malay businesses. Well, Simpang 312 also has its own 'commercial district'. Hidden away, near the end of the simpang there is a turning, a very rough and ready track that takes you away from the 'residential district'. Follow it for a hundred yards or so and you find what appears to be thriving plant nursery business. 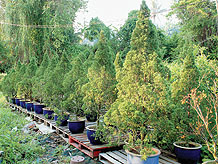 An abundance of plants and shrubs in neat rows testimony to a well-run enterprise. 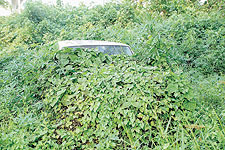 Another surprise, although perhaps it should not be, is the presence of two vehicles, one looks like a four-wheel drive, hard to tell because only the roof is visible above the foliage. They have obviously been parked there for some time. Is it possible that the owners have forgotten where they parked them? As I stated earlier, vitamin D is free in Brunei's sunny climes and to take maximum advantage of this I was wearing shorts. It may surprise you to know that people have made remarks about my appearance in shorts. I can never quite catch what they say but obviously I make quite an impression. Anyway, in Simpang 316, or at least in this part of it, something else is free as well. Mosquito bites. I suspect that it is only rarely, (if ever before), that the local mosquitoes have had the opportunity to sample such a fine vintage English blood. Well, they were now certainly making up for lost time. I put down my Nikon and started slapping frantically at my legs. I put up a pretty good fight, and there are many mosquitoes for which this was the last supper. However, I was substantially outnumbered and decided that too much exercise is probably as bad as too little. And do I really need vitamin D? It was time to go. With a last slapping session I picked up my Nikon and walked briskly back to the main road. The setting sun lent a magical rosy glow to Simpang 316 as I strolled home (just across the road), wondering if we had any Tiger Balm ointment in the house. Now where did I park my car? Kiulap has recently undergone a development boom which has seen several major investments in the area. These include two hotels, The Plaza Hotel and the Palm Gardens Hotel that includes a brand new state of the art Fitness Zone. Q-Lap Mall is a brand new, major shopping mall development that includes cinemas, food courts, a supermarket as well as trendy coffee shops and chic gift shops. These developments have transformed Kiulap into a hot spot of social and recreational activity, as well as a first rate shopping and business centre. Kiulap also offers all the facilities that businesses need. 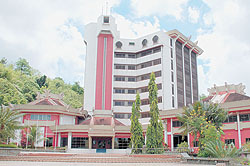 Banks, local and international, insurance companies, and real estate agencies, are all located in Kiulap. Rents are lower in Kiulap than in other major shopping and commercial centres and this, plus its great location with easier access and parking and fewer traffic jams means that Kiulap is fast becoming the first choice location for business and recreational activity. Kiulap Jetty allows easy access to Kiulaps’ shops and businesses to customers from Kg Ayer. And they take advantage of it in large numbers. Aneka Rasa, one of Kiulaps most popular restaurants, famous for its great value buffets is located by the river and at night its riverside eatery is often packed to capacity. Coffee shops like Coffee Zone and stylish restaurants like Manjaro, (which has recently redesigned its menu) offer free wireless internet to the hipper and more youthful clientele that visit Kiulap to eat, meet and generally hang out. Saffron is a unique middle eastern restaurant with great food and an attractive interior. Just about every other business and service is available in Kiulap, such as Health Express, the recently renovated spa and hair dressing salon, (probably the only ground floor hairdressing/spa salon in town), Innerspace, a modern furniture store. Meanwhile at Q-Lap Mall all the latest movies, both Asian and Western can be watched in the comfort of your own reclining armchair. This makes it easier to sleep if the movie turns out to be less exciting than anticipated! Q-Lap Mall also offers a range of eating places that include coffee shops, fast food and food courts. And if you are looking for a special gift there are trendy gift shops and fashionable jewellers and gold shops that offer stylish gifts at bargain prices. Those investors responsible for Kiulaps' transformation into a major social and business centre should be applauded for their courage and determination to proceed with major developments of this scale in what is generally considered an economic downturn. Let’s hope that their example will encourage more Bruneians to invest locally rather than overseas.